Note: While review will be spoiler free, it does assume you’ve read the previous books in the series. If you haven’t started yet, check out VBC’s review of book 1 Some Girls Bite. Chicagoland Vampires is absolutely one of my favorite series. I love Merit’s Chicago and how effortless it is to slip into her world. I love the way the characters all feel like old friends. 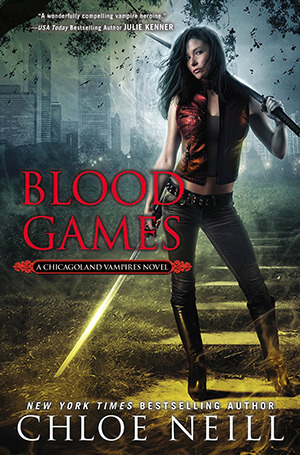 Blood Games marks a return to the way things were in earlier books for Merit and company in many ways. Grandpa Chuck has gotten the band back together and asks Merit and Ethan to assist the ombuddies on a murder case with possible supernatural ties. Mallory is back in her brownstone doing magic and helping out with the investigation. And Merit gets help from Jonah and the Red Guard. She’s even having trouble communicating with her father—just like old times! But there’s also a new complication in their lives. At the end of Wild Things, Ethan challenged Darius for leadership of the Greenwich Presidium, the vampires’ ruling council, and a week later is still waiting for a response. That situation, and its resolution, turned out nothing like I was expecting! Perhaps because of all those different things going on, I felt a little bit like the book was a series of vignettes rather than a coherent whole. But those vignettes are all remarkable. In one, Merit dances ballet to work out her stress, rather than her usual martial arts workout. She also gets to meet the RG’s version of Jeff Christopher. But my favorite scene is when Merit and Jonah go to a Con to see a source about the murders—she gets critiqued on her Sentinel costume! And you won’t believe the merchandise they’re putting Ethan’s face on! The other upside of having three different plots to resolve is that we get three separate climactic action scenes which showcase Merit at her badass Sentinel finest. Meanwhile, Ethan is far from the perfect book boyfriend that he was in Wild Things. An old acquaintance surfaces to bring up parts of his past he’d rather forget and refuses to share with Merit. His return to aloof alpha is actually something of a relief, since when everything is going well, I keep waiting for Very Bad Things to happen to him (again). The strain in Merit’s relationship with Ethan also gives her more quality time to spend with Jonah and Mallory and I really enjoy those scenes. Blood Games feels like both an ending and a beginning to me. Most of the political machinations that began in House Rules have come to an end, but several new characters are introduced that may or may not be allies in the future. 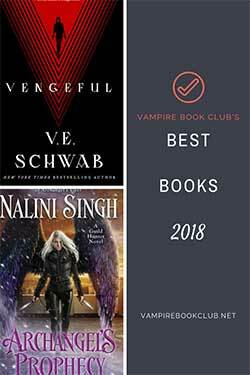 They include Amit Patel, the world’s most powerful vampire, and the Masters of some of the other American Vampire Houses. I suspect there will be more a lot more political intrigue, as well as the return of Morgan, to come in the next book. There’s also a big surprise at the end that promises to make life interesting for Merit and Ethan. Note: Don’t forget to enter to win a Chicagoland Vampires prize pack including a coveted Cadogan medal. Contest ends next week!. Currently reading. I’m not that far into the book, but something has kept me from devouring it like I have with other books in the series in the past. Your review definitely makes me want to get moving on reading! 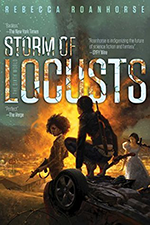 Thanks 🙂 I didn’t have any trouble reading it straight through on release day, which is a tradition I started with book 5, but I didn’t put it down with that OMG feeling at the end like I did with some of them either.